Zhao Yun can use attacks and escapes interchangeably. Zhao Yun cannot use the Eight Trigrams to try to produce an Attack. 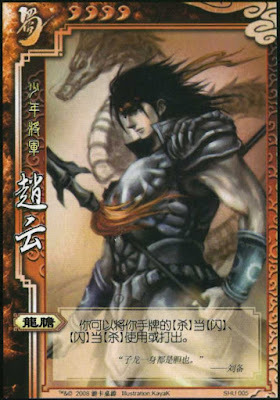 Zhao Yun cannot use the Serpent Spear to discard two cards to produce an Escape. Zhao Yun is very well balanced offensively and defensively. "Dragon Courage" allows him to respond to many different situations so long as he has an Attack or Escape. Once Zhou Yun runs out of Attacks and Escapes, it becomes very apparent to all of his enemies. At this point, he is vulnerable to pretty much any type of assault, including Attacks, Duels, Barbarians, and Raining Arrows. Despite the fact that he is very well rounded, Zhou Yun does not have many complex strategies that he can employ. Liu Bei (as king) - "Dragon Courage" allows Zhao Yun to respond to Liu Bei's "Fierce General." Effectively, Liu Bei can gain half of Zhao Yun's power by giving him an Escape and asking him for an Attack. Zhang Jiao - Zhang Jiao's strategy relies upon other people to Attack him. Zhao Yun will have an easier time attacking him than most other characters. Lu Bu - Zhao Yun is a great warrior, but he is no match for for a one-on-one with Lu Bu when responding to his Attacks or Duels. King Zhao Yun is not a good king. He is well balanced, but when he is the center of attention of the rebels, he will run out of Attacks and Escapes quickly and become vulnerable to any type of assault. Zhao Yun is a poor loyalist. "Dragon Courage" is very self-serving and is not particularly good at killing rebels quickly. Additionally, he usually cannot use this ability to benefit the king. Rebel Zhao Yun is also a poor rebel. He can keep himself alive fairly well, but he can do little to help or protect his team. When he is a rebel, it is not uncommon for the other rebels to be gunned down (since Zhao Yun is difficult to kill). At the end of the game, Zhao Yun often finds himself outnumbered, and eventually meets his demise. Spy Zhao Yun is a serviceable spy. As the spy, Zhao Yun need not worry about helping a team. With "Dragon Courage," he can fly under the radar and last the entire game. However, it is important to mention that there is little that Zhao Yun can do when one team gains an advantage over the other. 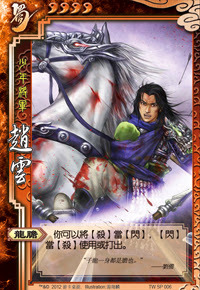 Zhao Yun seems to have been 'left behind' in the game of San Guo Sha. Since teamwork is so heavily emphasized, it is understandable that a character with only a self-serving ability would not be useful. He is best as an offered choice to beginners who are learning this game. The ability to use Attacks and Escapes interchangeably is useful in helping them stay alive for the entire game in order to have fun and learn how this game is played.